Performing a variety of original songs and favorites from the past century of folk music, George Mann and Julius Margolin combine social and labor history with songs and a dose of slapstick wherever they perform. Mann and Margolin are also songwriters, and their songs are strong commentaries on many contemporary issues, from gun violence (Too Many Guns), the aging process (Don’t Let Age Get You Down), and the plight of the working poor (We Demand A Living Wage) to the hardships facing workers (Respect Construction Workers and Somebody Robbed the Pension Plan). Farewell to the Thief! is the fourth and final title in the long-running anti-Bush series Mann has produced since 2001. 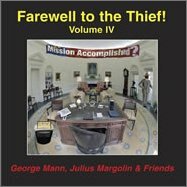 This new CD features many of our nation's best-known folk artists, such as Tom Paxton, Utah Phillips, Anne Feeney, Magpie, Jim Page, and the duo Emma's Revolution, as well as Mann and Julius Margolin, his 92-year-old singing partner, in a delightfully funny and hard-hitting collection of songs about the debacles of the Bush administration.